TVMountain just uploaded a nice basejumping clip. 2008. 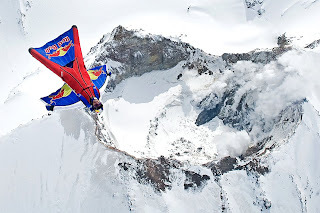 Valery Rozov makes a BASEjump from the Elbrus. Located in the North Caucasus, Russia, it's the highest point of the mountain range. With its peak altitude of 5642 meters, its actually higher than the Mont Blanc, and concidered the highest peak of Europe. Special thanks to Deniq for the news-submit.